CALCORIO is a web based recipe and assembly calculator, developed by makuendras and asdff45. The most important features are ready to use now, so we decided to make CALCORIO available for everyone. More features are in development or planned and will be for released in future releases. So please stay connected! Please let us know, if you are missing features in CALCORIO. Please check Patchnotes and images for further details. NEW: Add Rocket recipe (in 0.15.31: 100 rocket parts + 1 satellite). We named the recipe "shuttle". "Real" responsive design Solution for selection recipes on mobile devices. Shared URLs are still possible to open and view on most mobile resolutions. If you have any further ideas or wishes, please let us know at 'info@calcorio.com' or below this post. Added Rocket recipe (e.g. in 0.15.19: 100 rocket parts + 1 satellite). We named the recipe "shuttle". 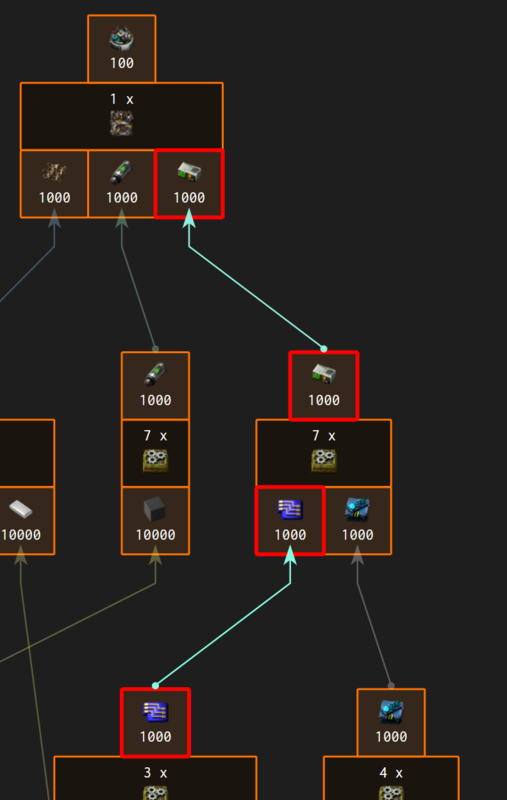 Added recipe for "space science pack"
All basic ingredients (e.g iron ore, copper ore) are displayed in lowest layer of the recipe and not somewhere in the middle. For full size view please click on the image. Last edited by asdff45 on Fri Jul 28, 2017 1:56 pm, edited 4 times in total. Looking good! But I'm missing rockets in the list. And I don't mean the weapon, but the rockets that are made in rocket silo's. Can you add those? Bart wrote: Looking good! But I'm missing rockets in the list. And I don't mean the weapon, but the rockets that are made in rocket silo's. Can you add those? Thanks! If you mean "rocket-part"s, they are in the list. If you mean the rockets, you need to get "space-science-pack"s: We put this feature on the list! Thanks for the hint!! Never give up. Work hard. Love what you're doing. I meant the rocket, which consists of 100 rocket parts and 1 satellite . Looking forward to the implementation, keep up the good work! 2) The research box would be even easier to use if you allowed people to search for words instead of part name (for example I'd like the "rocket part" search to look for items matching rocket and part). It would feel more natural to use. 3) Still on the selection of recipe : you could organize the recipe choice the same way it's when you craft ingame when you hit 'E'. 4) There are some suboptimal choices, or at least one suboptimal choice when it comes to crafting with oil industry : solid fuel is always made with heavy oil. It should be prefered light, it's more efficient. Overall the oil industry could get some love in fact. I think I'll use it a little (up to now, my absolute reference is Foreman), but there are some really cood challengers popping out currently, including yours. Koub wrote: 3) Still on the selection of recipe : you could organize the recipe choice the same way it's when you craft ingame when you hit 'E'. @Koub: Thanks for your statement! 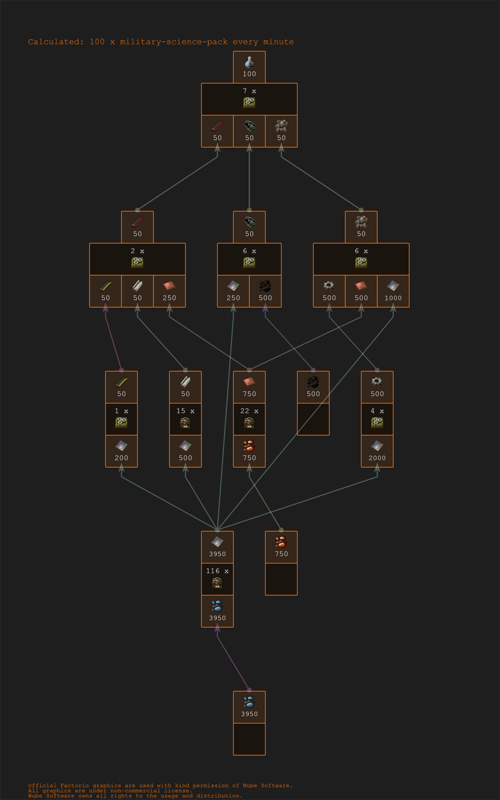 We really liked your idea for choosing recipes with the ingame crafting menu. I started to implement a first version and I think choosing recipes with it would work really fine. We put this feature on the list for one of the future releases. Your other ideas are already on our list. We want to bring all calculations to perfection and also have some ideas for the fluid calculation. Also sharing calculations will be possible later, for now please use the download function. I just had another idea : one thing that has already owned me when using Foreman, was ... the ignorance of typical belt throughput. I had built everything according to the ratios, but it appeared that I just didn't have a wide enough main bus to accomodate all that stuff . That's why I suggest, on "items per timeframe" views, to add the information on how many belts of each type you'd need to carry all that. For example, you could add a small icon of each belt tiers and a 2 significant digit number of how many saturated belts belts would be needed to feed this. Example : you want yo make a 1RPM facility. Calcorio says 77500 copper plates per minute. How many belts would I need to achieve that ? I was looking at this and found a surprising number of green circuit factories (35) were required to make one high tech science pack per second. I found this hard to believe and checked with a couple other tools and found an error. The number of blue circuit factories seems to be double. Calcorio says there should be 24 assembler 3 machines for 1 high tech pack per second. Helmod (viewtopic.php?f=92&t=30465) comes up with 12 and Web-based Factorio Calculator (viewtopic.php?f=134&t=48830) also says 12. It looks like there needs to be an adjustment for lower levels when the higher level makes two per cycle. Real nice tool and good presentation. Greybeard_LXI wrote: I was looking at this and found a surprising number of green circuit factories (35) were required to make one high tech science pack per second. I found this hard to believe and checked with a couple other tools and found an error. Hey Greybeard_LXI, thanks for your feedback and your hint!!! We tested our calculation today and found the bug. The calculation is incorrect, if the recipes output is 1 and one of the needed ingreedients is less than 1. We'll fix this asap and release it in v1.0.1 (maybe today!? ). Last edited by makuendras on Fri Jul 28, 2017 1:55 pm, edited 2 times in total. Koub wrote: I just had another idea : one thing that has already owned me when using Foreman, was ... the ignorance of typical belt throughput. I had built everything according to the ratios, but it appeared that I just didn't have a wide enough main bus to accomodate all that stuff . That's why I suggest, on "items per timeframe" views, to add the information on how many belts of each type you'd need to carry all that. @Koub: Sorry for the late reply! We plan to include a calculation for belts and inserters (too slow/too less inserters also destroy the calculation) in one of our future releases. Last edited by makuendras on Fri Jul 28, 2017 1:54 pm, edited 1 time in total. Now, that Factorio v0.15.31 seems to become the next stable version, we decided to updated CALCORIO to the next version. Today we published "CALCORIO v1.1.0" with a lot of new features. Please check the patch notes above too learn more. I really like the new selection menu, thanks to @Koub for this great idea! 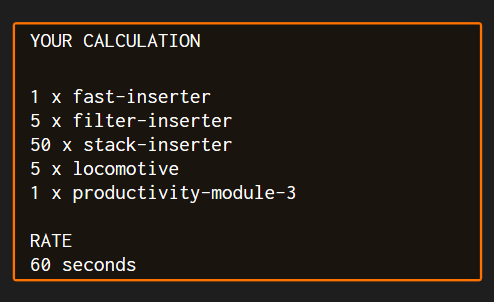 We are planning some other helpful settings (e.g.module, belt and inserter calculation) for the next version. Please stay connected and check our list of planned features above. Last edited by sicklag on Wed Jan 10, 2018 8:15 pm, edited 1 time in total. 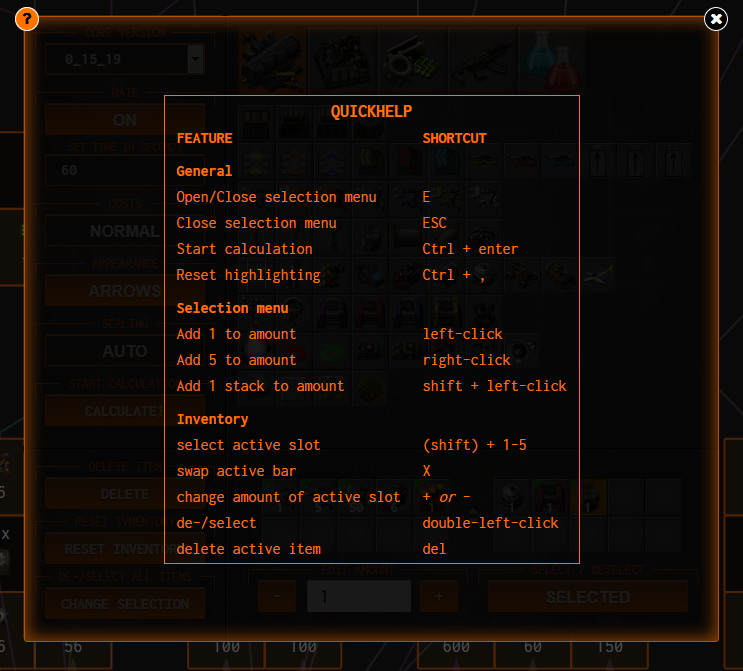 asdff45 wrote: [*] Option to select your current assemblies and bonuses, to optimize the recipe for early- and late-game. Maybe reading the first post could be nice before asking for new features, y'know ? sicklag wrote: I searched for 5h and more for a (early/mid-game) calculator and didnt found a nice one <.< 'em all are late game friendly. Actually, https://synopia.github.io/factoratio/ has all the capabilities to let you select what tech level you are for your planning. 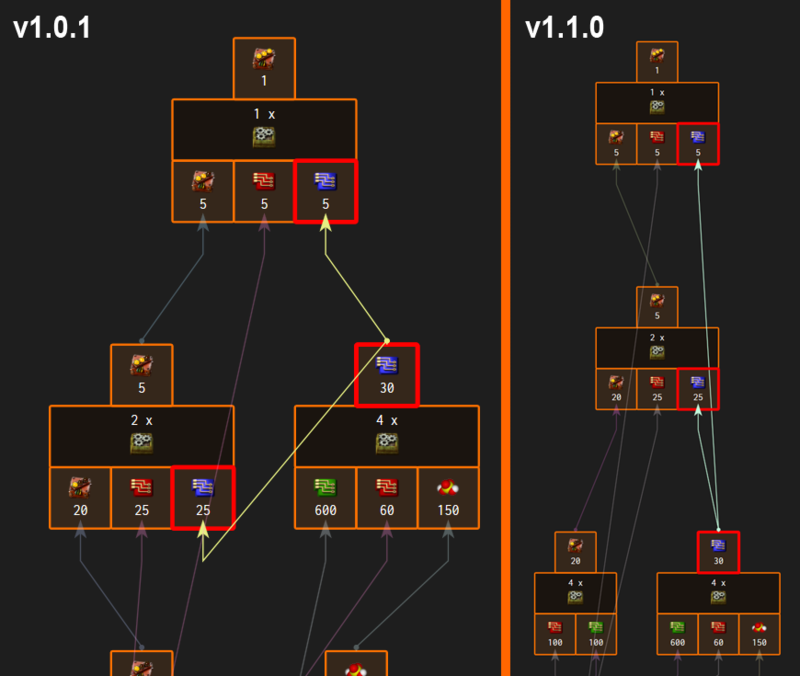 It lacks the nice graphical tree Calcorio has though, but you can plan even red science with AM1 if you want. Last edited by sicklag on Wed Jan 10, 2018 8:14 pm, edited 2 times in total. You know it's planned. Don't look for it, wait for it . Hello everyone, thanks for still being connected to Calcorio and for following it's progress. Your feedback is very helpful to make Calcorio better step-by-step! sicklag wrote: It's useless, for me and all the people they are in early/mid- game That would be really usefull if you implement the assembling machine 1 and 2 as an option. Also the option to switch between stone/steel/elec. furnances would be very useful. I searched for 5h and more for a (early/mid-game) calculator and didnt found a nice one <.< 'em all are late game friendly. Is this possible or just a dream of me? Hey sicklag, you're right, at the moment Calcorio always calculates the machines you should use in late-game to be most efficient. You may try to use the best assemblies and furnances you currently have in each state of the game and just upgrade it later, when having better ones. So you don't need to delete and rebuild your Factory again and again. So Calcorio is not useless for early-/mid-game, it just forward-thinking for late-game! As @Koub mentioned, the feature for selection/deselecting machines is planned for one of our future releases for people, who need them. Please check the "Planned features" section of our first forum post above. [Edit by Koub] This is an English Forum, please make the effort to make yourself understood by the vast majority of its readers. For the English speaking people: the Google translation is more or less correct. Thanks to @Koub for editing! In the left selection bar you should select your current game settings, e.g if you are playing on normal or expensive costs or what your core version is(yes, we now that 0.15.33 is not available now, but you can use 0.15.32, because no recipes have changed ). If you want to calculate, how to craft an amount of items each minute or each hour (or whatever), you should enable the "rate"-option and select the desired rate (in seconds). The settings for appearance and scaling are just "nice-to-haves", and do not change the culculation, but the way it's displayed. 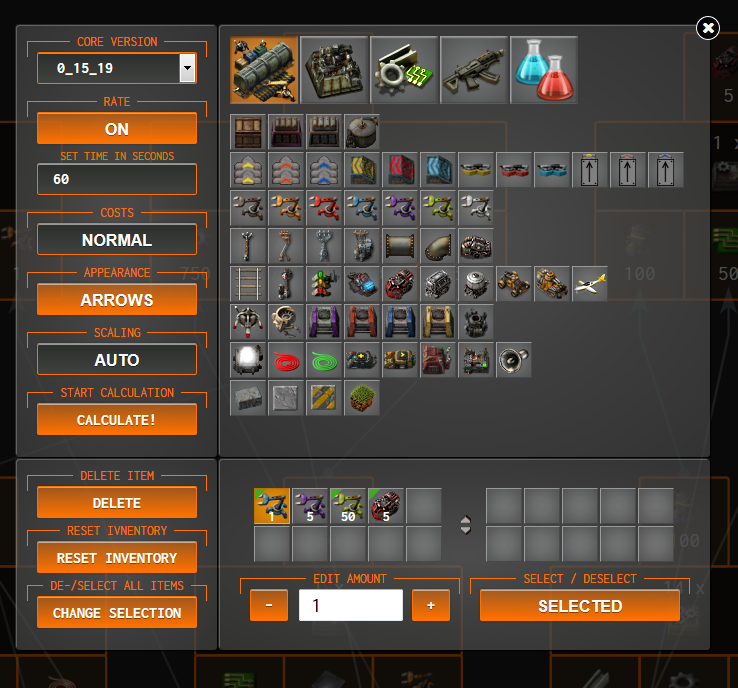 Now you can use the menu as the ingame inventory of Factorio. For example: You can click an item to select it for your calculation with left, right or shift+left-click (amount: 1,5 or one stack). The item appears in the "hand-bar" below. You can edit the amount by doing the same step again or by using the '-' or '+' buttons. You can de-/select an item by double-left-click it in the lower "hand-bar", so you are able to place up to 20 items in your "hand-bar" and just select the ones you need for your current calculation. By pressing "Ctrl + w" or by clicking "calculate", you start the calculation and it will be displayed, when ready. I hope, this quick summary helps you a little bit. Please let me know, if you have any further questions. Last edited by makuendras on Fri Aug 25, 2017 4:39 pm, edited 1 time in total. Last edited by sicklag on Wed Jan 10, 2018 8:14 pm, edited 1 time in total.